It’s tax time in Tempe, Arizona, for Wells Fargo volunteer tax preparers Mitch Van Horn and Heather Zilles. Unlike most people, Mitch Van Horn actually looks forward to tax time. 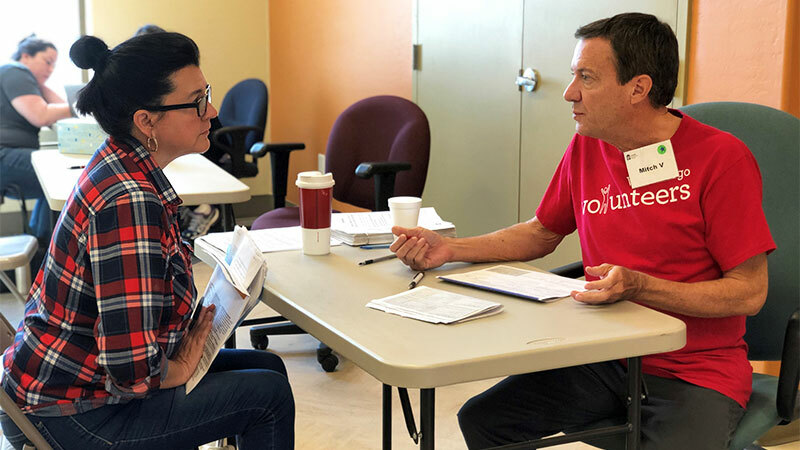 Since 2007, the Wells Fargo operational risk consultant has spent his Wednesday and Thursday evenings and Saturday mornings during tax season at the Volunteer Income Tax Assistance program site in Tempe, Arizona. Van Horn, right, answers a tax question for Pat Esparza. Sponsored by the Internal Revenue Service and groups like the United Way and AARP, VITA offers free tax help to individuals and families making less than $55,000 per year, including people with disabilities, seniors, and taxpayers with limited English-language skills. The program is run entirely by IRS-certified volunteers like Van Horn at sites throughout the U.S. that provide free, basic income tax return preparation services with electronic filing and information about tax credits, financial education, housing, health care, and other services. According to the IRS, 84,646 volunteers — including 1,000 from Wells Fargo like Van Horn — prepared 3,559,838 free income tax returns at 11,044 sites nationwide in 2018. Van Horn is one of 72 volunteers at the Tempe VITA site this year. In addition to preparing traditional state and federal returns for taxpayers trying to meet the April 15 filing deadline, the VITA site also participates in My Free Taxes, an online tax-filing program of United Way Worldwide, and helps international students at Arizona State University prepare nonresident returns. Lisa Price, a senior Community Relations consultant who manages Wells Fargo’s participation in VITA, Bank On, and other programs for the underbanked, said the company and its volunteers support about 70 VITA programs in the U.S. annually with tax preparation, financial education, and grant support. Zilles, right, crunches some numbers for taxpayer Alejandro Tirado. While 2019 marks VITA’s 50th anniversary nationwide, Diane Watkins, the VITA manager in Tempe, said the program has been serving underbanked residents in Maricopa County for 18 years. “While we recruit volunteers from many sources, our most reliable and dedicated volunteers come from the business sector — making the support from Mitch and his Wells Fargo teammates and from other companies an important part of our success,” Watkins said. Watkins said those who visited the site in 2018 received a combined $2.02 million in refunds, $627,694 in earned income tax credits, $300,899 in child tax credits, and $87,278 in education credits. While final numbers for 2019 won’t be available until after tax season, the Tempe site already had prepared 640 returns — 15 percent more than 2018 — through March 1.